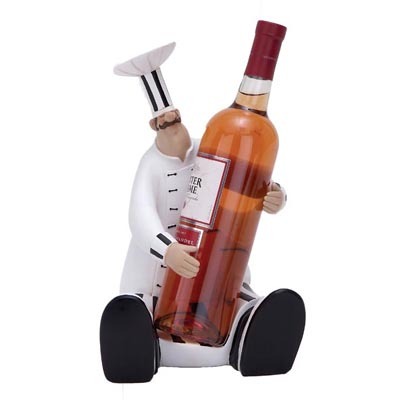 Our Sitting Baker Chef Wine Bottle Holder depicts a whimsical bakery chef holding a wine bottle. The pastry chef is simply eager to serve you the bottle of wine for the occasion. Handcrafted and hand finished in attractive black and white chef colors the Sitting Baker Chef Wine Bottle Holder is an excellent addition that will spark joyful conversation in the kitchen or bar. Cast from resin and stone mix. Wine bottle not included.